I've been busy in the kitchen all morning, getting as much done as possible before our company arrives! (They were suppose to arrive last night, but are coming this evening instead.) I have a spaghetti sauce simmering on the stove for dinner tonight and just finished making the sweet potatoes for tomorrow! I've had a couple requests for my recipe(s), after posting a picture on Instagram, and realized I had never shared them here before! Every Thanksgiving, even growing up, the "Sweet Potatoes and Desserts" were "my job" (my sister Jen always made the rolls and my brother Sean always made the Raspberry Cranberry Jello Mold!) 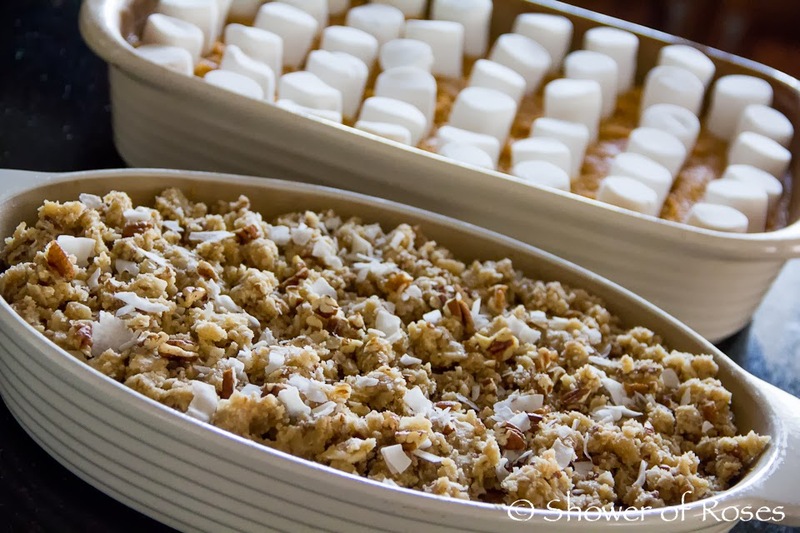 and yesterday my mom called for the recipe since I won't be bringing them over to her house (we will be getting together with my extended family for dessert) this year. 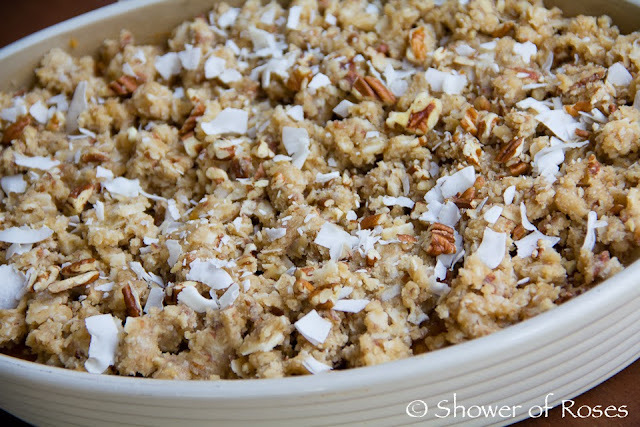 Note: This recipe will fill a 1 qt baking dish. I usually double the recipe for my Pampered Chef oval baking dish or triple the recipe for a 9x13 baking dish. 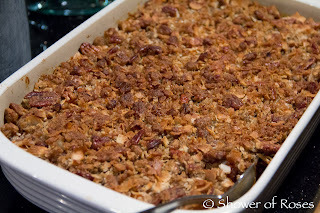 Place drained yams (I usually mash them) in ungreased casserole or baking dish. In a small bowl combine remaining ingredients; blend well. Sprinkle over yams. Bake at 350˚F for 35-40 minutes or until bubbly. Note: This recipe will fill a 1 qt baking dish. I always triple the recipe and bake it in a 9x13 pan. Mix butter, orange juice and cinnamon in lightly greased baking dish until well blended. Add sweet potatoes; mix lightly. (I always mash the sweet potatoes.) Top with marshmallows. 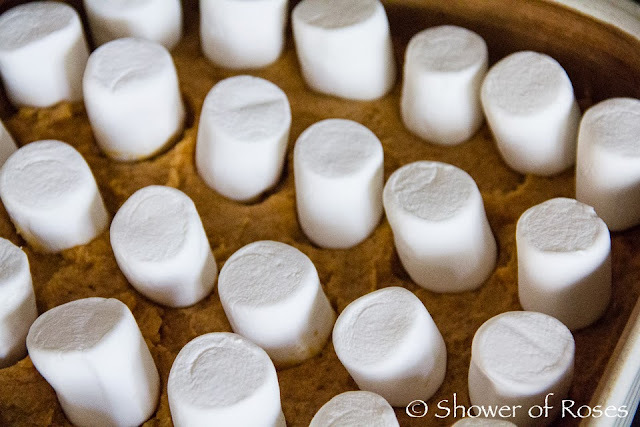 Bake at 350˚F for 15-20 minutes or until sweet potatoes are hot and marshmallows are lightly browned. *These last two pictures were taken last year on Thanksgiving. If you refrigerate them overnight they will take a little longer to bake. Now that the sweet potatoes are all ready for tomorrow, it's time to move on to the Raspberry Cranberry Jello Mold pies and other desserts! 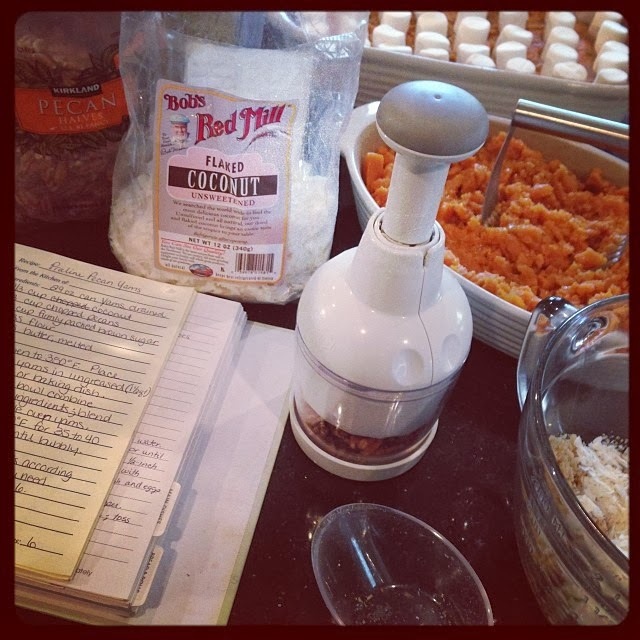 Do you have a favorite Thanksgiving recipe for sweet potatoes? I'd love to hear about it! 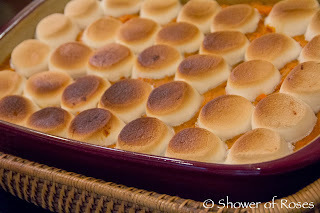 Most of us here don't like the marshmallow-y sweet potatoes. I know, it's some kind of Thanksgiving blasphemy. :) But several years ago we found a recipe we *love* and we now make it every Thanksgiving. Microwave some sweet potatoes until soft. Then peel and cube up the potatoes. I couldn't tell you exactly how many...depends on how big they are. But enough to cover a 13 by 9 pan. five or six? In a skillet, melt a stick of butter.Mix 1/2 cup of brown sugar with the melted butter. Then dump in a bag of fresh cranberries. Simmer them on med-low, stirring, in the butter until the skins split. My kids love this part because they make a little hissing noise as they split open. :) Pour the berries over the sweet potatoes. You can make them ahead of time and refrigerate them at this point. When you are ready to serve, toss in the over for 20 minutes or so until warmed through, or you can put them in your crock pot on low for about an hour and save oven space. Yum! I've never considered mixing the cranberries with the sweet potatoes! Sounds delicious! Thanks for sharing! I hope you had a Happy Thanksgiving! Oh good! Which recipe did you end up making? I hope you liked it! I'd like to hear the recipe for the Raspberry Cranberry Jello Mold...that sounds delicious! Love this blog and the beautifull pictures. But... one question... when, and with what do you eat the sweet potatoes? Here in the Netherlands we eat them in Surinam dishes. Or as a snack with salt fish and/or peanutsauce. We usually include them with our Thanksgiving fare such as roasted turkey with stuffing, and each family usually has a list of their own sides. I would say they are mostly eaten in the fall but in the last five years sweet potatoes have grown in popularity and are eaten like you mentioned and other ways sometimes sweet sometimes savory. I also enjoy baking with sweet potatoes year round. A couple of my other favorite recipes include a Zucchini and Sweet Potato Frittata for dinner and Sweet Potato Hash with Poached Eggs for breakfast (I'm making this today!). Had the sweet potatoes - tasted a lot like pumpkin pie. A new favorite. Hope you all day a wonderful Thanksgiving! I'm so glad you enjoyed the recipe! Happy Thanksgiving!